When I began my outdoor garden I didn't start it with a garden plan. I just started planting things where I had space and over the years things have gotten worse as I kept adding plants without fixing my original planting mistakes. be held until the fall. Digging my tulips up at this stage doesn't do them any harm. By now all the foliage of the tulips has died down and all the energy has been stored in the bulb. I'll be keeping them in pots, which hopefully, will help me remember which colors I have and where I want them to go. The main reason I've placed them in pots instead of just re-planting them now in the ground, is because I still have perennials that are growing and I don't want to disturb those roots. There is also the strong possibility that I will buy more bulbs when they hit the garden centers and that I may buy a few more perennials this year. 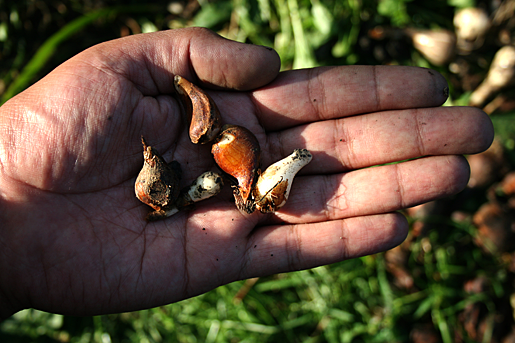 When digging up your garden bulbs you may unearth a number of smaller bulbs. These offsets are produced by healthy bulbs and can just be planted alongside your more mature bulbs. 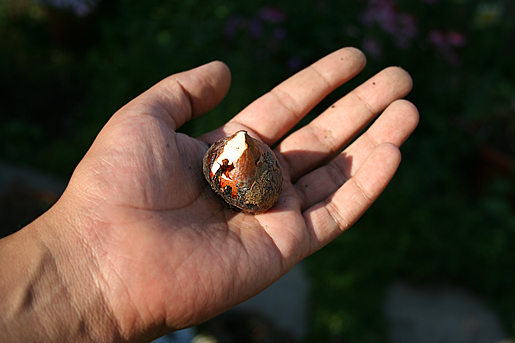 Throw away any bulbs which are soft, mushy or smell like rot if you come across any in your garden. Normally I wouldn't be digging up bulbs at this time of the year but the cool weather we experienced this weekend had me in the mood to do some preparations in the garden while I wait for autumn. 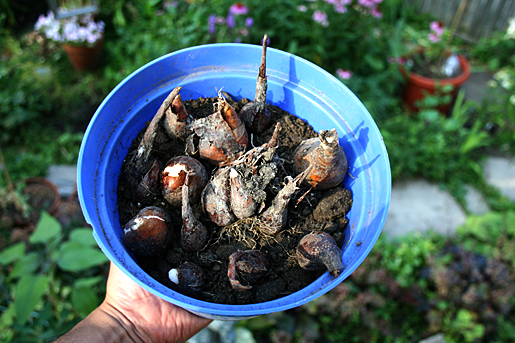 And now that I've dug up all of these tulips I won't have to do it October and November when it is cold, wet and rainy.